Be the first to share your favorite memory, photo or story of Connie D.. This memorial page is dedicated for family, friends and future generations to celebrate the life of their loved one. 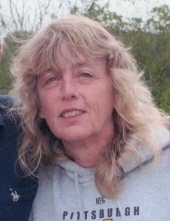 Connie Parr, 62, of Orrtanna, unexpectedly passed away on April 13, 2019. Born May 26, 1956, in Chambersburg, she was the daughter of the late William and Madoline Parr, Sr. She graduated from Gettysburg High School before going to work at Letterkenny Army Depot. She worked there for 26 years as a tank mechanic, being awarded a special commendation from President Carter for her work improving tank designs. After her retirement from Letterkenny, Connie went on to work at several juvenile detention facilities working to better the lives of troubled youth. Connie is survived by her daughter, Maddy Keiper (husband Joshua) and their children Conner and Kenleigh, step-son Tony Fickes (partner Jodie) and their son Brady, step-son Tommy Fickes (wife Vickie) and their children Kaylie, Courtney and Austin, and step-daughter Kelly Myers (husband Todd) and their children Erin and Lea. She is also survived by three brothers: John Parr (wife Susan), William Parr Jr. (wife Wendy), and Roger Parr. She also leaves behind many nieces and nephews who will miss their Aunt Connie tremendously. Connie was preceded in death by her partner of 33 years, Roger Fickes, whom she loved beyond measure. Additionally, she was preceded in death by three brothers, Glenn Parr, Dennis Parr, and Larry Parr. Connie loved the outdoors, kayaking, hiking, spending time on her deck and tending to her flower gardens. She also loved spoiling her two cats. A memorial service will be held on Thursday, April 18, 2019, at 6:30PM at Monahan’s Funeral Home, 125 Carlisle St., Gettysburg. Visitation will begin at 5PM. In lieu of flowers, donations may be made in her name to the Cumberland Valley Animal Shelter, 5051 Letterkenny Rd. W, Chambersburg, PA 17201. "Email Address" would like to share the life celebration of Connie D. Parr. Click on the "link" to go to share a favorite memory or leave a condolence message for the family.